Last week I was in the Caribbean for an energy medicine retreat and workshop. I did have some time away from our classroom to be out-of-doors, and I was stunned by how bright it was. The colors were so vivid! It was the tropics, with the sun directly overhead in midday. So much light! I kept encouraging myself to let as much light as I could into my eyes, not fighting it or squinting, just turning away or shading my eyes if it momentarily became too much. I thought about a time 15-plus years in the past when I had thick hard plastic contacts, which I wore all day long. Back then my eyes were extremely sensitive to light. I used the darkest sunglasses I could find when it was sunny, and it often still seemed too bright outside for me. Welcoming the light instead of resisting it was a big change! The painted conch shell above was given to me by a charming island woman selling jewelry she had created, right outside our restaurant just above the beach. She was so warm and friendly the joy beamed out of her. I did go back later and buy a small bracelet of beads from her, but it really didn’t feel like she had given me the shell just to drum up business. It seemed like she was overflowing with good happy energy, and only wanted to share it. 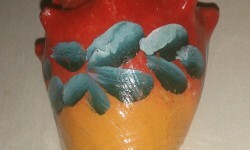 When I walked into the restaurant to get lunch with the painted shell in my hand, I felt like I had acquired a treasure. I closely examined the vibrant colors and the texture of the surface, my vision delighted. I thought again, as I had all week, that it’s easier to look at details when there’s a lot of light. So the optimums (objects you enjoy looking at and see more clearly than most things) are plentiful. It felt like seeing was much more of a pleasure than a struggle, that everything was interesting! So I kept looking at details, so found more to be curious about, so looked at smaller details, the positive visual cycle continuously reinforcing itself. For years I’ve realized, and taught my vision clients, that “the more you look, the more you’ll see”. My goal with this was to increase visual awareness (my own and that of others), hoping to pull us back from that automatic-pilot way of going through life, toward being present. Yet this was a new dimension — I didn’t have to coax my reluctant self to reach outside of my comfort zone and look, I wanted to look! And the more I looked, the better it felt — I became increasingly joyful, like an exuberant child. 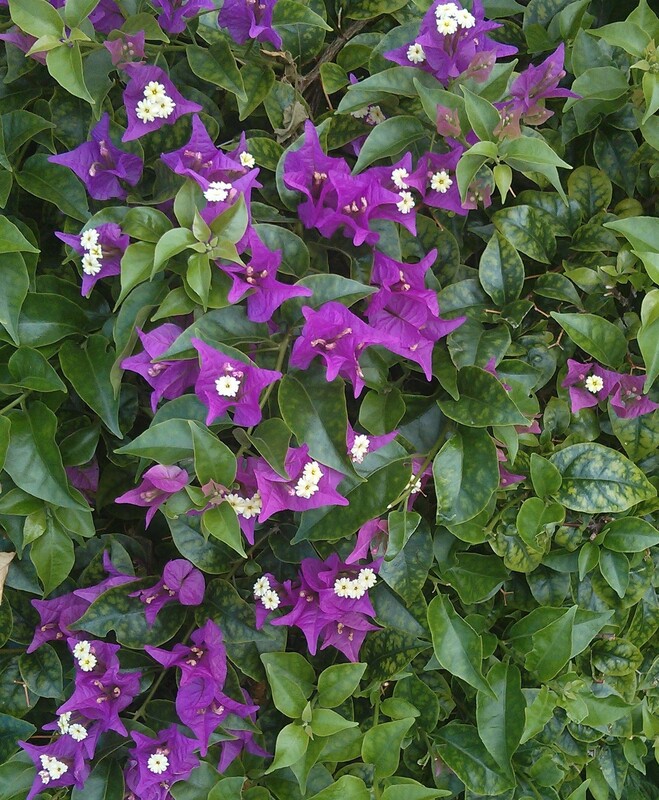 These purple flowers I saw on my way back to my room are one example. I stood in the middle of the sidewalk gazing at them like I was new to the planet and had never seen a flower before! OK, since I don’t plan to move to the tropics, how can I translate that clearer more relaxed tropical vision to my home environment in NY? The answer is a list of practices I’ve all thought of before: slow down, surround myself with friendly happy people, spend as much time in Nature as I can, focus on remaining relaxed. This last point is key for me. If I’m more relaxed, I’ll have less fear and feel safer. If it feels safe to me to look, I’ll look more and see more and see it clearer. I’m keeping the colorful shell handy on my desk to remind me of these healthy habits. Maybe I can have tropical vision in NY state after all! Previous Previous post: How Important is Visualization? Next Next post: I’ve Tried Everything!